Thren Felhorn is the greatest assassin of his time. All the thieves' guilds of the city are under his unflinching control. If he has his way, death will soon spill out from the shadows and into the streets. Aaron is Thren's son, trained to be heir to his father's criminal empire. He's cold, ruthless - everything an assassin should be. 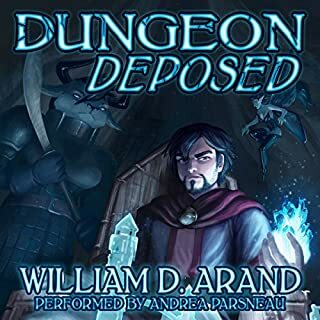 But when Aaron risks his life to protect a priest's daughter from his own guild, he glimpses a world beyond piston, daggers, and the iron rule of his father. On the young world of Dezrel, brother gods Karak and Ashhur, fleeing their own failed world, recreate mankind in an attempt to make amends. The fledgling race of humanity is guided by the First Families, men and women who will not age so long as their hearts remain devoted to their deities. But quickly the realms are thrown into chaos by the construction of the Temple of the Flesh, built by exiled children of Karak in the unclaimed land of Haven that lies between the two kingdoms. Five hundred years ago, brother gods devastated their world with civil war. When they were imprisoned, their conflict ended without a victor. Centuries passed while their followers secretly continued the war, a war that will soon have an end. The gods have found their paragons. When half-bloods Harruq and Qurrah Tun pledged their lives to the death prophet Velixar, they sought only escape from their squalid beginnings. Instead they become his greatest disciples, charged with leading his army of undead. 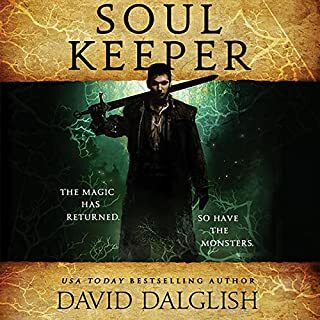 The first in an all-new fantasy series from USA Today best seller David Dalglish. Six islands float high above the Endless Ocean, where humanity's final remnants are locked in brutal civil war. Their parents slain in battle, twins Kael and Brenna Skyborn are training to be Seraphim, elite soldiers of aerial combat who wield elements of ice, fire, stone, and lightning. When the invasion comes, they will take to the skies and claim their vengeance. 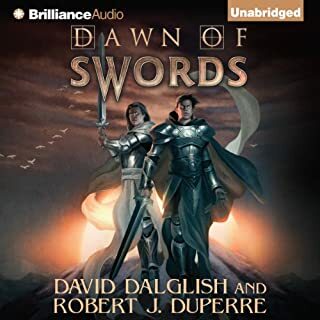 Where does Skyborn rank among all the audiobooks you’ve listened to so far? By far one of my favorite books that I have listened to in a long time. It provides a comfortable change of pace from other fantasy books, without making it feel forced. What was one of the most memorable moments of Skyborn? The moment when Bri decides to avenge her fallen love, not only is a huge turning point for the character, but also a huge turning point for the story itself and you can feel the tension through the speakers. He read the book with a very nice flow to it, making the story feel fluid. I admit there were a handful of moments when it was difficult to understand him, but overall I quite liked his performance. Spread your wings, and be free. The story is quite compelling, giving the perspectives of two siblings with alternating chapters gives the reader several opinions on specific events. 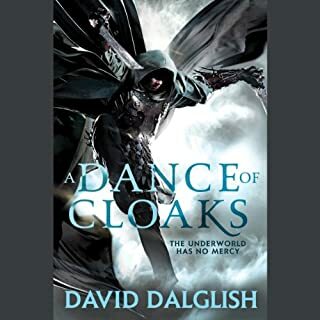 I also loved how intriguing the initial story was, and on top of which Dalglish teased at an even darker plot without revealing hardly anything, but just enough to the point where I can't stop thinking about the possibilities. Highly recommend. I absolutely love Davids books and writing styles. This book has highlighted his improvements as an author. the story is fun and compelling. I highly recommend it and am already waiting for the next two!! I struggled to finish this story as the characters became rather annoying to me after the first couple chapters but the world was interesting enough for me to finish it. Would you listen to Skyborn again? Why? Absolutely, I have listed to it three times now. 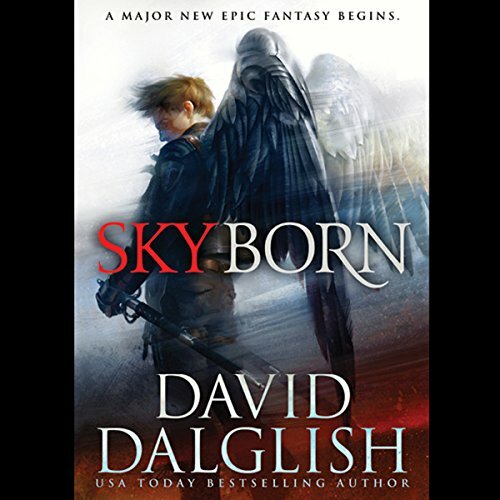 What other book might you compare Skyborn to and why? There are elements of this series that remind me of Mistborn or the Rithmatist. Like Mistborn, you can't really appreciate all the depth of this book, until you read book two. It also has some themes that reminded me of the Star Wars Trilogy. He stays out of the way and lets the story tell itself without distraction. David Dalglish has always been great at action and creating heroic backstories. In this series, he shows off his world-building and mystery skills. The main characters pissed me off. Brenna is a spoiled child always whinning and crying about something and Keal is kind of a lame coward. This book could have been better if the author gave the main characters better personalities. It was a struggle to keep listening to this book. What would have made Skyborn better? I didn't think it was possible, but David Dalglish has written a terrible book. 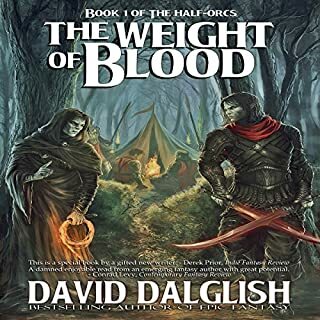 After the Shadowdance series, I didn't think that David could do a bad book. That series was great and ever moment of was worth it. This though, this is just a terrible book, and after listening to it I have to say I don't see myself getting the next one. It's shame because the world and premise are pretty cool. And some of the characters, while all of them are kind of shallowly developed, are kind of interesting. But I just can't get around the main characters. Fair warning - there will be spoilers from this point forward, so if you are going to read/listen to this book, I would say stop here. So starting with the least of the things that make this book bad, Kael, one of the 2 twins that make up the protagonist of this book, is annoying because of how weak he is. I don't mean weak physically or anything. I mean personality and character wise. His twin sister, the main reason this book is bad and I will get into that later, is implusive, strong willed, and determined, and for some reason because always seem to figure that if one character is that, then the other has to be self-conscious, timid, and unable to take care of themselves. I get that you don't want to have all the characters the same, but I don't get why they have to be the complete option of the spectrum. This isn't the first book to do this; it's a common trope in books right now (just like love triangles) and it getting kind of overplayed now (also like love triangles). Kael is somewhat of an interesting character, but the it overshadowed by how often he just can't stand-up for himself or see himself as anything special. But honestly the book could be tolerable if he was the only issue. The real problem is with the other protagonist. Brea, where to start? Well like I said she is impulsive, strong willed and determined, which can be good traits, but she is also brash, and doesn't back even when she is wrong which she is often. And she just gets away with or is actually rewarded when she does something wrong. From the get go there is nothing endearing about her. In the opening of the book she drags her brother out to watch a battle and then abandons him when he wants to seek cover (which is smart and sensible), calling him a coward. She is very pushy and selfish. She never thinks about why something might be wise to do or why she should just get to do what she wants. When she get kick out of training for not following orders cause she is bored (this is the military where it's not just about knowing how to do something but about how well you can follow orders too) she just goes off and does what she wants. And she even gets reward for it in a way by meeting her love interest because of it. She continues do what she wants, and then when her brother is being picked on she jumps straight to violence with no thought about how it will affect anything. And if you think "at least she is looking out for her brother" she later reveals that she didn't do for him at all but only cause they also made fun of her. I can deal with a protagonist that has some bad traits if they at least start to learn from them or have to deal with the consequences when they make bad choices, but Brea just keeps rampaging along without a care in the world about how it affects anyone but herself. And the nail in to coffin for this book is when she kills a person in cold blood for no just reason. In this world people can request a dual to setting issues between them. This is a governed and legal method allowed in this world. So Brea's boyfriend issues a dual to a man who killed his brother. This man killed the boyfriends brother also in a dual, but it is never said who issued this dual. The man might have or the brother. Either way, you are allow to refuse a dual. So no matter who issued the dual, the brother always had a chance not to fight and chose to fight. The man won. The boyfriend has a right to be mad and want to avenge his brother through a dual which he does. He choses to issue a dual to the man. The man is only responding to it. Duals are watch over by the governing body and offical. They are to the death. The boyfriend knows this going into and so does Brea. He wants to fight this man. The man ends up winning fair and square. Brea being upset attacks and kills the man. Not in a dual, not in a official or legal way. For all we know the boyfriend and the brother just hate this guy for no reason and keep requesting duals from him. There is nothing this man is guilty of other then defending himself. And she kills him in cold blood. And you may say "but she was upset about losing her love" which is true. But what she thinks that pushes her into action isn't how much he meant to her or how much she loved him. No what gets her to attack the man is that it's not fair that he gets to have a normal life and her life has to change now. She's only worried about how her life is affected by this and thinks it unfair. And the best part? Nothing happens to her. She doesn't get punished. She doesn't get killed out of the military. She doesn't have to face any consequences for wrongly killing a man in cold blood right in front of the governing officials. She just gets to continue on being selfish, implusive, and brash with out a care in the world. There is nothing likable about her. Oh and just so you, it also barely even phase her that her boyfriend is dead. Like 2 chapters later she doesn't even care anymore. Sorry for the long rant and spoilers, but I was just stunned by how terrible of a book this was after coming off of David's other books. I would recommend almost any of his books to anyone who enjoys fantasy, but I would say stay clear of this one. Has Skyborn turned you off from other books in this genre? What character would you cut from Skyborn? Honestly the protagonist, or at least Brea and maybe just retune Kael. 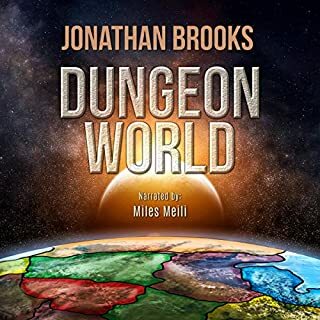 I started this book because I wanted a new series to listen to. Was finished in one week! Really great performance from the reader and the story is one you don't want to stop. Can't wait for the second book. I feel the need...the need for speed!!! Ever wanted to fly through the sky on wings? How about shooting elemental magic at your foes? How about getting swept up in a few heated romances? Then you’re gonna love Skyborn!!! I know I did...I’m already downloading the next book! look this might just be me so dont take this review as gospel. The story didn't go anywhere, the two main characters were either over the top or like dead fish at times, they had zero growth through the story. when it ended I was grateful for it to be over and angry that nothing was resolved in any of the plot points.